If you are looking for a tuber you can send me a note through the contact form. You can email me a wish list anytime or give us a call from after 6:00 pm PST or any time on Saturday and Sunday. Recently, I started working full time. I will email you, or give you a call and let you know what is available on your list. We are currently sorting the dahlia tubers and waking them up so the eyes will show and be ready for planting next month. If you emailed me a wish list I have not forgotten you. I will be done sorting by the 1st week of May. I will update what is available soon. 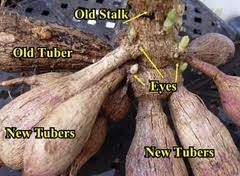 Tuber Price: $5.00 each, plus actual shipping. I only ship within the US. Payment is not due until I get ready to ship your tubers. The Dahlia Divas plant back what is needed for the next growing season, but there is always extra tubers available. Some varieties are limited or not available for the next growing season.